As you can see, I did some hiking this month, mostly on the Neusiok Trail. I’ll do some more on that in a separate post. I’ve been working on a new sock pattern, I’m almost done knitting them so I can write and post the pattern to ravelry, hopefully by the end of this week. Lots of pictures of my dogs. Panzer had his semi annual vet appointment this week hes doing really well. The vet told us he wishes all 10 year olds he see were this healthy. I think its because the younger dogs keep him active and playful. And we actually walk our dogs everyday, I’m convinced thats the reason my husky lived to be 16 and was pretty healthy for all but his last 6 months. We did lose a chicken. When they were out in the yard a hawk killed one. So the ladies have been stuck in there coop for the last few weeks. I’ll start letting them out again in the spring, when there is more food around and the ladies wont be such a target. Towards the end of the month my bulbs started flowering. I’ve been really missing winter, probably because I see everyone’s pretty snowy pics on instagram, but I’m over it and so glad spring is here! This entry was posted in Instagram, Life, North Carolina on March 2, 2017 by RyanMcGurl. **Flood and Rain update. So far we are doing fine. Our pond is the fullest I’ve ever seen it, and there are large standing puddles around the yard, but so far no actual flooding. I think we should be fine, the nearest river is half a mile away, and is a slow moving river that empties into a large tidal marsh. Jon’s new garage/workshop. Its pretty awesome. Tried a few new restaurants locally, Minoda’s sushi and hibachi, and Circa 81 for brunch. Both were very good. Fort Macon State Park. A nice tree/driftwood on the beach. Tried a new recipe, Tatziki Sauce on a pita with chicken and veggies. I climbed the Cape Lookout Lighthouse! The view from the top was amazing! A paper collage I started about 6 months ago, then put aside, and have been working on again. 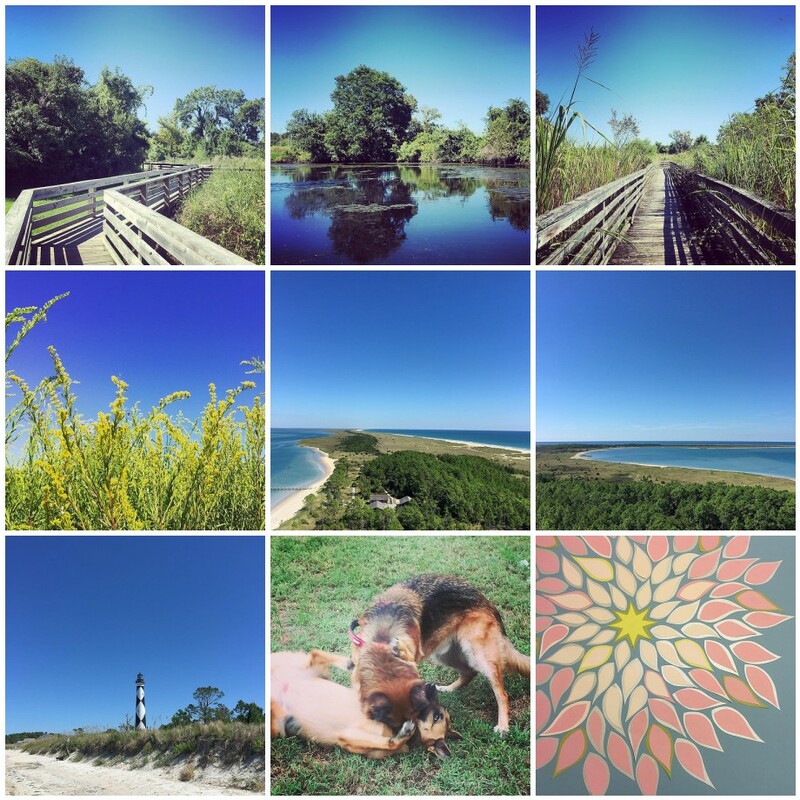 This entry was posted in Beach, Hiking, Instagram, North Carolina, Summer on October 5, 2015 by RyanMcGurl. It was great having a weekend of just Jon and I, no dogs. I actually got to walk around the village of Ocracoke. Usually I can’t because Chewie doesn’t walk far any more, or do well in the heat. And we got to sit in one of the restaurants overlooking the harbor for the afternoon, without worrying about Panzer barking every time someone walks past the truck. 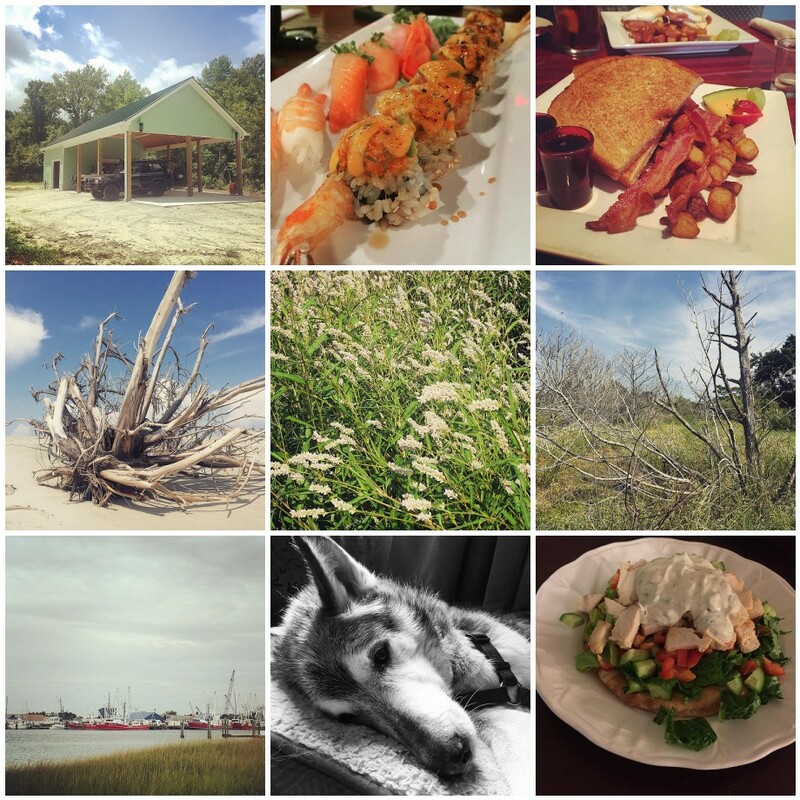 We didn’t even make it to the beach this weekend, just enjoyed relaxing and doing very little. Panzer and Sasha sharing a bed. They are so cute when the behave. The beach at Cape Lookout. Onion harvest from my garden. I grew all these in one 16″ pot. 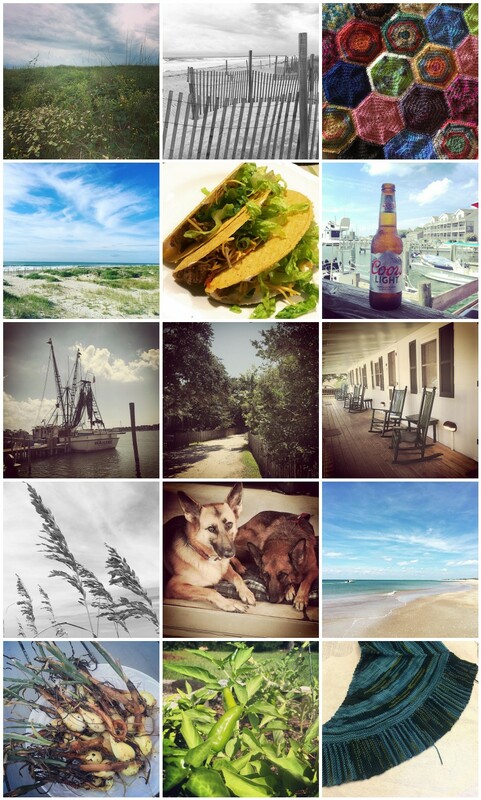 This entry was posted in Beach, Instagram, North Carolina, Summer on September 10, 2015 by RyanMcGurl.